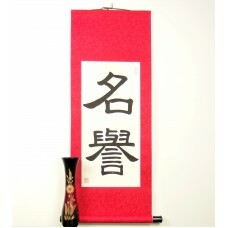 This Bushido calligraphy features one of the seven virtues of the Samurai, "honor." These characters refer to one's own character and reputation rather than doing honorable things. It means being worthy of honor. However, the two versions of honor are closely related since if you do honorable things then you will be worthy of honor yourself. 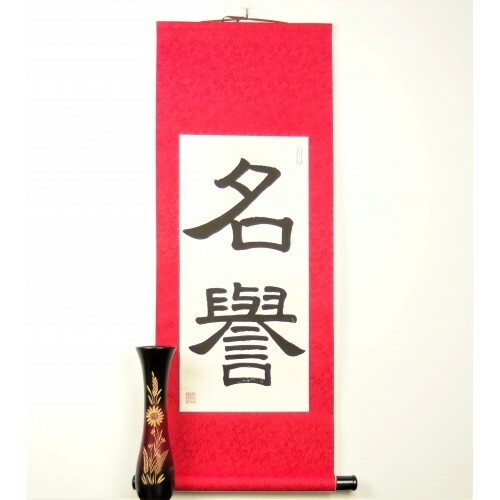 The ancient Samurai valued personal honor so much that they committed suicide to restore their honor. We would suggest you don't go quite that far! This concept is similar to the Biblical statement that a "good name is to be desired more than gold."